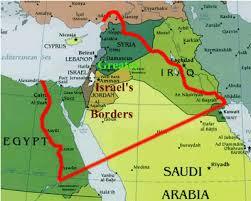 The Euphrates “Gateway” to Armageddon! “And the sixth angel poured out his vial upon the great river Euphrates; and the water thereof was dried up, that the way of the kings of the east might be prepared,” Revelation 16:12. 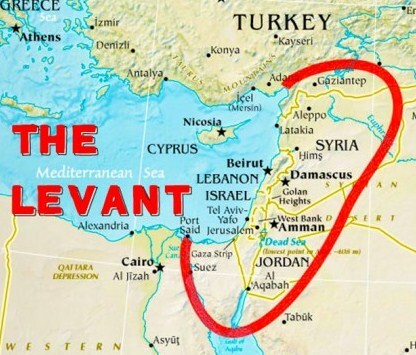 What makes up the near exact centre of the Muslim Levant…? It’s Israel! ISIL stands for the Islamic State of Iraq and Levant. Now, to us Westerners we don’t really make much of a distinction, do we…? NO, honestly from our perspective it’s all about the same. But, how would a Muslim living in the Middle East view it…? Just what is the Levant anyway…? The geographical term “LEVANT” refers to a multi-nation region in the Middle East. It’s a land bridge between Turkey to the north and Egypt to the south. If you look on a map, however, in the near exact middle of the nations that comprises the Levant, guess what you see…? Come on, guess! Yes, you have it right …it’s Israel! When US President Obama refers over and over to the Islamic State as “ISIL” instead of “ISIS,” he is sending a message to Muslims all over the Middle East …that he personally does NOT recognize Israel as a sovereign nation BUT as a territory belonging to the Islamic State! According to Revelation 9:14 the war will originate from the area of the Euphrates River, which flows through the Middle East, the river is adjacent to Iraq, Syria, Turkey and Iran. This is where the war will originate and today ISIS is conquering points along this river! “And the four angels were loosed, which were prepared for an hour, and a day, and a month, and a year, for to slay the third part of men,” (Revelation 9:15). The “third part of men” would be over two billion people! Other translations read “one-third of the human race”, “one-third of all the people on earth”, “one-third of humanity”. They all say the same thing. A war is just ahead that will kill over two billion human beings! We must keep our eyes fixed on what is happening in the Middle East… and of course TIME will tell all! Now let’s discover together this volatile area of the "Euphrates River" and "Israel" to see how it’s so connected and what will happen there in the future… NASA studies recently have indicated that the “Fertile Crescent” region in the Middle East is losing fresh water at a rapid rate and the water flow in the important Euphrates and Tigris Rivers has decreased as a result of this trend and formerly arable land in the area has become cracked and dry. The Tigris and Euphrates Rivers are drying up, and these are the very rivers that were once a critical part of the Cradle of Civilization, in ancient Mesopotamia, 2000 years before Christ. The decrease in water primarily has resulted from a major drought in 2007 and the loss of snow pack in the mountains to the north …and the vast decrease in fresh water in 2008, which continues today. This loss has occurred over the last decade and amounts to over 144 cubic kilometres of water lost from these ancient river basins, which include vast areas in Turkey, Syria, Iraq, and Iran. The Euphrates River is completely situated in Islamic Muslim countries! It is mentioned in the Bible in the Book of Revelation in a prophecy that is predicted to occur just before Yeshua (Jesus) returns. For thousands of years the Euphrates River has stood as a military barrier between the East and the West and runs for approx. 2,800 kilometres from its headwaters in the mountains of Turkey. It flows south through the territory of Ancient Babylon until it empties into the Persian Gulf. During the Great Tribulation when the global destruction of the Last Days is threatening the very existence of life on Earth, there is a famous prophecy that the River Euphrates will be dried up to make way for the “…kings of the east” (Revelation 16:12). 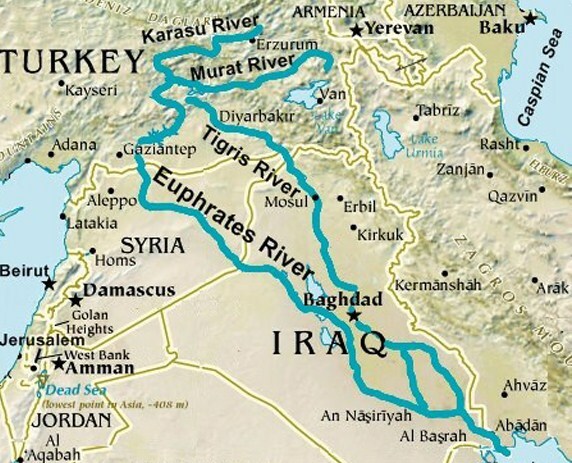 Historically, the Euphrates is the border between the Middle East and Asia. Biblically, God told Abraham He would give to His people (Abraham, Isaac and Jacob) ALL the land between the Euphrates and the Nile (Genesis 15:18). The Euphrates is also the place where four angels are bound for a day and an hour to perform a certain judgment of God …which is to kill a third of mankind (Revelation 9:14). It was one of the original four rivers coming out of the Garden of Eden (Genesis 2:14). Mesopotamia is known as the “Cradle of Civilization” for this is where civilization began according to the Bible… “Mesopotamia” is a Greek word which means; “between the rivers.” Mesopotamia is between the two great rivers we know today as the Euphrates and the Tigris Rivers which flow through the Middle Eastern countries of Iraq, Syria and Turkey. When people think of Mesopotamia they often think of the land in southern Iraq where the city of Babylon existed. We need to remember that Mesopotamia extends right up to the area in Southern Turkey between the sources of the rivers near Lake Van. The first mention of the land of Mesopotamia in the Bible is found in the account of the Garden of Eden where God created the first human beings, Adam and Eve (Genesis 2:10-14), …and where the names Pishon, Gihon, Tigris and Euphrates Rivers are mentioned. In 1996 a scientist from Boston University, Farouk El-Baz, examined satellite photos of northern Arabia and Kuwait and to his amazement easily detected a dry riverbed cutting through the limestone of northern Arabia. He noticed that the riverbed petered out as it reached the sand dunes of central Arabia. Now the interesting thing is that this ancient river fulfils all the requirements for one of the rivers of Eden! Notice what Genesis 2:11-12 says… "The name of the first (river) is Pishon; it is the one which encompasses the whole land of Havilah, where there is gold. And the gold of that land is good. Bdellium (fragrant resins) and the onyx stone are there." The Arabian Peninsula is RICH with bdellium and precious stones as well as having a rich deposit of gold near the source of this ancient river and so it fits the description of Havilah. This evidence points us to the delta region of the Tigris and Euphrates rivers near the top of the Persian Gulf as being the area where the Garden of Eden was …and where God created our first parents …Adam and Eve (Genesis 2:7). We all know the story of how they disobeyed God by eating the forbidden fruit and were cast out of the garden. They chose to decide for themselves what is right and wrong instead of yielding to God’s way! God sentenced them and all mankind that sprang from them to live cut off from God with a few exceptions to fulfill God’s plan for redeeming mankind. After their son, Cain, killed his brother Abel… we read how he was driven away and lived east of Eden in the "land of Nod" and built a city after the name of his son Enoch. This city was east of the Tigris River probably in the ancient land of Elam in Southern Iran. Wickedness of man and EVIL was on the face of the earth in the times of Noah... "And God saw that the wickedness of man was great in the earth and that every imagination of the thoughts of his heart was only evil continually. And it repented the LORD that He had made man on the earth, and it grieved Him at his heart. And the LORD said I will destroy man whom I have created from the face of the earth; both man, and beast…But Noah found grace in the eyes of the LORD," Genesis 6:5-8. All mankind died in a massive global flood that God brought on the earth because of their sin. But, through Noah, his wife and three sons and their wives mankind was given another chance as God saved them through the ark which he told Noah to build. We read in Genesis 8:4 that, “...the ark rested in the seventh month, on the seventeenth day of the month, upon the mountains (plural) of Ararat, in eastern Turkey” …not far from the source of one of the upper branches of the Euphrates River (beginning near the town of Erzurum) where the post-flood history of mankind began! The Mountains of Ararat also extend into Armenia. The land of Babylon where the early Sumerian civilization blossomed is in southern Mesopotamia and it is both south and east of Ararat. The plain of Shinar to which Noah’s family migrated and where Nimrod built the city and Tower of Babel is to the west of Mt. Ararat (Genesis 11:1-2). One of the two upper branches of the Euphrates has its source near Mt. Ararat and travels east to west in the direction that Noah’s family travelled. The region of Turkey that they would have travelled through is extremely mountainous until they reached the point where the Euphrates turns south near the present day Syrian border. And here, the mountains end and the region flatten out into a plain. This plain near the present day towns of Haran and Urfa is the Biblical plain of Shinar (Genesis 10:8-10). So then what is so symbolic about the Euphrates River…? Why there…? At the time of the sixth trumpet the Euphrates seems to serve as the boundary, or a landmark, of the antichrist kingdom…. 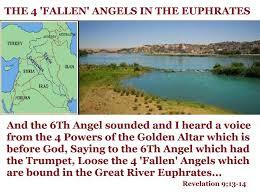 The Euphrates River flowed out of the Garden of Eden… where history and rule of man began and will be a part of End-Time! It was here where Satan first tempted and overthrew man in the Garden of Eden… The first sin that resulted in the fall of the human race took place at the head of the Euphrates River (Genesis 3:1-7). Now Satan’s destruction will begin here as well… It was here that the first murder took place (Genesis 4:8) and it was in this same region of the Euphrates that the first organized rebellion against God also took place (Genesis 11:3). This region could become the centre of the antichrist kingdom, or a part of it. Therefore, the people who follow the antichrist will ultimately be destroyed… Muslims and other unbelievers should think very seriously about this! Why does the location of Eden matter…? When God judges a nation or an individual …He takes them back to the beginning and shows them their origins. God wants them to remember what they were and where He brought them from in the day of redemption. Only then can they learn who God is and who they are, in Him …so they can begin again in faith. This new hope for the future always lies with a remnant, thanks to God’s mercy and grace. When God judged Israel in 586 B.C., He didn’t take her to Egypt but to exile in Babylon, Mesopotamia (Jeremiah 25:9-12; 29:10). God called Abraham to leave Ur, 1500 years before (Genesis 11:28, 31). This city lay along the Euphrates in southern Iraq. When Israel returned to Mesopotamia, the major city was Babylon, many miles up the river. God symbolically took Israel back to the beginning, to the land of her nativity. A holy remnant returned to Judea decades later …they had given up idolatry for good. When God judged Israel again, He took her to Bethlehem. Yeshua (Jesus Christ) was born in the City of David in order to fulfill divine prophecy (Micah 5:2, Matthew 2:1-8). He was the “offspring” or “son” of David (Matthew 9:27, Revelation 22:16). Yet the Messiah’s birth was also an act of divine judgment. Time was up when Yeshua (Jesus) came… for God “now commands all men everywhere to repent” (Acts 17:30). He has appointed Yeshua (Jesus) as the righteous judge (Acts 17:31). Israel’s physical kingdom began in Bethlehem when Samuel anointed David as king (1 Samuel 16:12-13). God’s spiritual kingdom began here too, when Yeshua (Jesus) was born “King of the Jews” (Matthew 2:2). Let’s apply these truths to Eden and Mesopotamia... Many Biblical events happened in Turkey, including Paul’s four missionary journeys, BUT the most famous one is the flood. This volcanic Mount Ararat lies “between the Black Sea and the Caspian Sea … at the borders of Turkey, Iran,” and Russia. Streams forming the Tigris and Euphrates rivers also flow from this region of Mount Ararat. When God judged the world with a flood, he took Noah and his family back to the beginning, where life began in Eden (Genesis 6:13, 17-18, 7:1). His creating the world, then Adam and Eve, and putting them to work in Eden were all acts of grace. God’s saving Noah and his family as a remnant was also grace. “Ararat” actually means “curse reversed.” Eden itself means “delight” or “pleasure.” Its four rivers also have rich meanings… Euphrates means “fruitfulness” …Gihon means “bursting forth” …Tigris means “rapid” and Pishon means “increase” or “overflow.” These words sound like life in the Spirit. They’re a promise of “Eternal Life” in heaven, but few people experience it. They prefer sin and self. Therefore, divine judgment isn’t over. We know that… “But as the “days of Noah” were so shall be “the Coming of the Son of Man,” Matthew 24:37. Sinners will die unprepared…? Does this parallel have other meanings…? 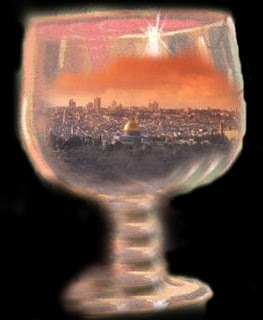 During and after the Great Tribulation (Armageddon or the Gog and Magog War) will it once more be that God will take this sinful world back to the beginning to the greater “Promised Land” to Abraham which included much more than tiny Israel today…? After judgment, a holy remnant will enter heaven for eternity. The New Jerusalem will have a “river of life” and a “tree of life” (Revelation 22:1-2). This certainly sounds like Eden! We are living in exciting but dangerous times where we see history in the making... Everyone can clearly see that Europe is being taken over by Muslims, this is a fact. Based on birth rate studies, in order for a culture to maintain for more than 25 years the required fertility rate must be 2.11 children per family. Historically a culture has never reversed a fertility rate of 1.9 children per family. AND IF the fertility rate hits 1.3, it is impossible for that culture to reverse because it would take that culture 80 to 100 years to correct itself. In fact there is no economic model to sustain a culture during that time. Let’s look at the birth rate of Europe: France 1.8, England 1.6, Greece 1.3, Germany 1.3, Italy 1.2 and Spain 1.1. Across the European Union that consists of 31 countries, the cultural fertility rate is 1.38. Historical research tells us that these numbers are impossible to reverse. In just a matter of years, Europe as we know it will cease to exist. But, Europe is growing and birth rates are high. So then what is taking place…? Islamic immigration…! We are seeing bible prophecy coming into fulfilment right here, right now in our life times… Islam is NOT going anywhere …and Islamists Muslims are pushing for a global caliphate. Friends, this is real! This is what is sweeping the Middle East. This has the potential to sweep ANY AREA that has a strong Sunni Muslim presence. Bible Prophecy talks about a One World Government …a One World Religion …a One World Currency, and so on. Islam has all this already built into their global jihad plan. We have to admit that what is happening …is happening! We are literally witnessing the enemies of God rising up and paving the way for the kingdom of the antichrist. A thought to ponder on… Revelation 20:4 tells us the Christian martyrs will die by beheading, and that is a fact! But, here is what we have to ask, where are the huge number of forces that are being trained to kill Christians and Jews as well …because we know that Jews will also be persecuted against during the tribulation? Who has been training up their children to kill at such a young age…? Islam! 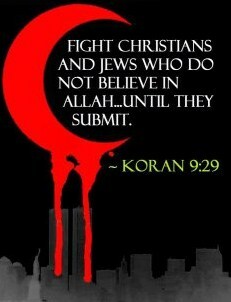 Muslims are taught to hate Christians and Jews. Muslims are taught to kill the infidel. Beheading is the standard form of execution. Muslims are taught from a young age to die for the cause of Islam. Muslims are taught to kill for the cause of Islam. ALL the countries mentioned in Scripture that are associated to Christ's physical return are ALL Muslim countries and are clearly named. There is no refuting that! For example, the Chapters in Isaiah 13 - 29 all deal with Christ’s literal Second Coming and the destruction of Israel’s enemies… Isaiah 13 – Burden of Babylon; Isaiah 14:24 – Burden of Assyria; Isaiah 14:28 – Burden against Philistia (Gaza); Isaiah 15:1 – Burden of Moab; Isaiah 17 – Burden of Damascus & Samaria; Isaiah 18 – Burden of Ethiopia; Isaiah 19 – Burden of Egypt; Isaiah 21:13 – Burden against Arabia; Isaiah 22 – Burden against Jerusalem (areas occupied by enemy); Isaiah 23 – Burden against Tyre. ALL of these other than Israel are Muslim Countries! In fact every time the sword of the Lord is mentioned, it is always in association to a Muslim country. Ezekiel 30:4- 5; “And the sword shall come upon Egypt, and great pain shall be in Ethiopia, when the slain shall fall in Egypt, and they shall take away her multitude, and her foundations shall be broken down. Ethiopia, and Libya, and Lydia, and all the mingled people, and Chub, and the men of the land that is in league, shall fall with them by the sword.” We must accept the fact that Islam and the descendent of Ishmael, Esau and Lot are the Last Day players. Over and over again they are mentioned by name in scripture. 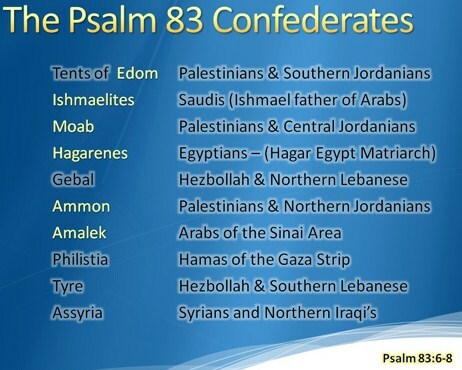 We can also find the enemies surrounding Israel in Psalm 83. It is therefore NOT surprising to see what is taking place in the Middle East today especially in this very area where everything began and in nations that surround the Nation of Israel… Are the dramatic events we have witnessed in Iraq since “Iraqi Freedom” and in recent days, the invasion of the murderous forces of Islam known as ISIS the ignition of Armageddon…? With the many signs of the Biblically prophesied End-Time now storming our generation on history’s horizon… we must examine the things involving the place called the “cradle of civilization” carefully. If you have not been paying attention, ISIS is sweeping the Middle East like swarms of Locusts devouring and destroying wherever they go. Who are ISIS/ ISIL…? From ISIS (Islamic State in Iraq and Syria) to ISIL (Islamic State of Iraq and the Levant) to IS (Islamic State)… how did a most notorious terror organization evolve…? Islamic State (IS) terrorist savages are infamous for their extreme ruthlessness such as broadcast of decapitations, crucifixions, mass murder and forced conversions. When and where did this heinous wave of violent extremism originate…? The Quran teachings of Muhammad! Every terrorist organization out there in the Middle East from Khorasan (an off shoot of Al-Qaeda), Hamas and others are Sunni Muslim. 87 - 90% of all Islam is Sunni, 11-12% is Shia and 2% or less is Wahhabi and other minor sects. ISIS is a Sunni terrorist organization and that is why they are growing in strength, numbers and finance. ISIS now controls northern Syria and almost all of Iraq. They are moving to gain more control of Syria and also moving into Lebanon. They have threatened Jordan that they will be coming there next, and some reports show that they have already crossed into Saudi Arabia, but do not control any towns there yet. If ISIS is able to topple Bagdad, this will embolden them and then they will set their sights on Iran. If they are able to take Iran, which it is looking like it could be very well possible; ISIS will become the defector leaders of the Middle East. They have threatened to fly their black flag over the Vatican, the US White House …and to destroy Christianity! ISIS, Duwlat al-Islam (the Islamic State in Arabic) is an offshoot of al-Qaeda, was established in 2003 by Abu-Musab a-Zarqawi as a small militia fighting the US army in Iraq. Several small and extreme Islamic Sunni factions banded together against the Americans in Iraq after the fall of Saddam Hussein, calling them al-Qaeda Iraq. From its earliest days on, the terror organization became notorious for its recorded beheadings of captives. One of the first decapitations was Jewish-American businessman Nick Burg. The US army uncovered tapes of some 80 beheadings which were never published and this has since increased! The organization branched out in its terror activities and committed barbaric attacks in Egypt, Jordan, Lebanon and Yemen. A-Zarqawi was killed in 2006 during a US Air Force attack; his successor was killed three weeks later. This, however, was not enough to bury the organization, which continued its acts of terror, including those against Shiite Muslim targets. IS (Islamic State) has since developed into an army numbering more than 50,000 terrorists and many Westerners are being recruited. ISIS/ISIL leader Abu-Baker al-Baghdadi, who is shrouded in secrecy, had the organization change its focus from terror attacks to territorial conquest, and under his command IS began taking control of swaths of territory – first in Iraq and then in Syria taking advantage of the instability in both countries, and succeeded in overrunning the local governments and subjecting the populations to its reign of horror. In 2014, following disagreements with al-Qaeda, IS became a self-standing terror organization. Al-Baghdadi declared all territories under IS control a Sunni caliphate, in which a strict form of Shariah (Islamic religious) law is enforced. The Islamic State functions as a state, with an organized government system and various branches of administration. IS aspires to return to the seventh century, when Islam was established. Its attitude towards Christianity, women and all aspects of life is based on this world view. The fact that IS has declared its rule as a caliphate and has become more encompassing in its territorial description testifies to IS’ aspiration to rule the Islamic world …and in time, the entire world! All populations captured by IS are immediately forced to convert to Islam. If they refuse, as in the case of the Yazidi in Iraq, they are executed en masse or raped and sold into slavery. Their goal is eventually ISRAEL…! The Islamic State (IS), previously calling itself the “Islamic State of Iraq and the Levant (ISIL)” or the Islamic State of Iraq and Syria (ISIS‎), and also known by the Arabic acronym; DaÊ¿esh is an unrecognized state and a Sunni jihadists group active in Iraq and Syria in the Middle East. A caliphate was proclaimed on 29 June 2014, Abu Bakr al-Baghdadi who is now known as “Amir al-Mu’minin Caliphate Ibrahim” was named as its caliph, and the group was then renamed the Islamic State (IS). In its self-proclaimed status as a caliphate, it claims religious authority over ALL Muslims across the world and aspires to bring most of the Muslim-inhabited regions of the world under its political control beginning with territory in the LEVANT region which includes ISRAEL, Jordan, Egypt, Lebanon, Cyprus and part of southern Turkey. "Armageddon" is the Biblical term most everyone thinks of whenever war begins to look imminent in the Middle East… Even the mainstream media at times use this troubling name into their reporting when war seems to loom. Armageddon is prophesied in the Book of Revelation to be an incrementally stepped-up war, rather than a single battle. It will be a conflict that progressively involves more and more nations until the military forces of all nations of the world come together in a triangular valley called Jezreel, near an ancient place called "Megiddo" in Israel. All prophecy yet future must be considered in light of this one fact… God’s chosen nation Israel is back in the land of promise! Understanding that country's position in the arena of Middle East and world affairs is critical to understanding all other geopolitical realities. That is, to know where the dramatic changes in Iraq are leading, one must carefully study that tiny, though militarily powerful state called Israel. Israel is prophesied to become an intolerable problem that world leaders think must be eliminated before there can be peace in the Middle East and in the world! God, Himself, will see to it that Israel will be a major obstacle to sin-flawed, "man-made peace." This is because only God’s Son, Yeshua (Jesus) the Prince of Peace can establish true peace on planet Earth! 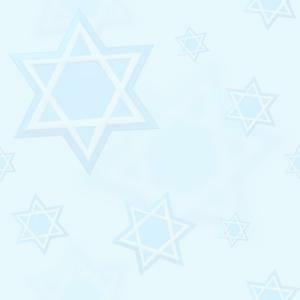 Do we see a volatile situation today with regard to the modern nation of Israel? Is the world community of nations, especially the United States, United Nations, other super powers and very especially the Muslims fretting over problems between Israel and its neighbours? The answer is, of course, a resounding, "Yes!" The on-going process to force peace upon the Middle East …no matter the consequences to the safety of Israel is irrefutable evidence that the world is extremely nervous about the Jewish state and its enemy neighbours. The Problem is Supernatural…! A reasonable question for those who truly seek world peace is this …why is Israel always at the centre of the problem that threatens to involve the whole world in nuclear war…? World leaders cannot understand the answer God’s Word the Bible gives to this "reasonable" question. This is because, world leader’s reason in line with Satan’s thinking …and not in line with God’s thinking which comes from His perfect foreknowledge! Today’s world leaders believe they can find the formula for peace totally apart from taking into consideration God’s explanation of the supernatural causes involved. Satan hates Israel because Israel is the nation chosen by God to bring the Saviour into the world and it is to Jerusalem where the Saviour will return. The devil, as he is also called, is prophesied to do all within his considerable power to destroy Israel and the Jewish people. The antichrist will be the devil’s world dictator who will try to carry out Israel’s destruction, as outlined in Daniel, chapters 7, 8, 9, 11 and in Revelation chapter 13. "Behold, I will make Jerusalem a cup of trembling unto all the people round about, when they shall be in the siege both against Judah and against Jerusalem. And in that day will I make Jerusalem a burdensome stone for all people: all that burden themselves with it shall be cut in pieces, though all the people of the earth be gathered together against it," Zechariah 12:2-3. It becomes obvious, for those who believe that Bible prophecy should be taken literally, that the area now called Iraq, is mentioned prominently as having a role to play in history that is seems to be unfolding rapidly…! We can be sure the prophetic Scriptures haven’t yet been fulfilled because the region has never been rendered completely uninhabitable as foretold in Jeremiah 50:1-3; 51:47-48. Already the world community is demanding that "peace" be made between Israel and its Middle Eastern neighbours. The world’s leaders see the Israeli/Palestinian conflict as holding the greatest potential for igniting all-out- war. Additionally, the Jewish/Islamic differences are seen as explosive fuel that might be thrown on any war that might erupt in the region! The US and global leaders intend to do all within their collective powers to force peace upon Israel and those who want to push the Jewish people into the Mediterranean Sea. Daniel the prophet foretold a peace that will destroy many people (Daniel 8:25). 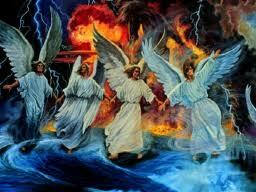 The antichrist, according to Daniel 9:26-27 …will be the leader who guarantees that seven-year covenant of peace. When this "man of sin," "antichrist" brings together Israel and her foes for that peace treaty, the "Tribulation" will begin. It will be God that will allow the antichrist to sign that "peace covenant" that will begin the tribulation, or apocalypse. This will set in motion a progressive series of conflicts that grows into the war called Armageddon. And, this will conclude with Christ’s return, when the last battle of the Armageddon war takes place in the Middle East. So, war with Iraq, Syria and even the terrorist hordes of ISIS and others attempting to establish a caliphate, hasn’t started Armageddon. BUT war, reignited by the nuclear threat posed by Iran or some other hostility in that volatile region, could, if destructive enough, to major populations …be the "straw that breaks the camel’s back!" Such conflict could hasten the world community into forcing Israel and her enemies to finally agree to the "so-called peace" which has proved so elusive throughout the great diplomatic efforts since Israel’s rebirth in 1948. Reading Zechariah chapter 5 leads us to observe that wickedness/evil is scheduled to return to the place called "Shinar," in present day Iraq. With the ancient Biblical prophecies involving the city of Babylon for the wrap-up of human history …it is important for all Christians and Jews to examine news coming out of that land where God said the first human beings were created. The blessed hope is that if we believe in Yeshua (Jesus) as our Lord and Saviour NOW, during the Age of Grace, we will NOT have to endure the terrible woes of the Tribulation nor see nor be within the winepress of God’s coming wrath. We will be raptured, meet our Lord in the air, and be led to heaven itself, where a place is being prepared for all believers. Maranatha Lord… we are waiting!